The present selection comes from the third section, Affairs of Man. In all the section has 鼓琴圖 Illustrations for playing qin, 象戲圖 Illustrations for playing chess (xiangqi), and 打馬圖 Illustrations for playing a game like dominoes. Further details not yet added. This illustration shows both 擘 (bo) the thumb plucking out and 托 (tuo) the thumb plucking in. 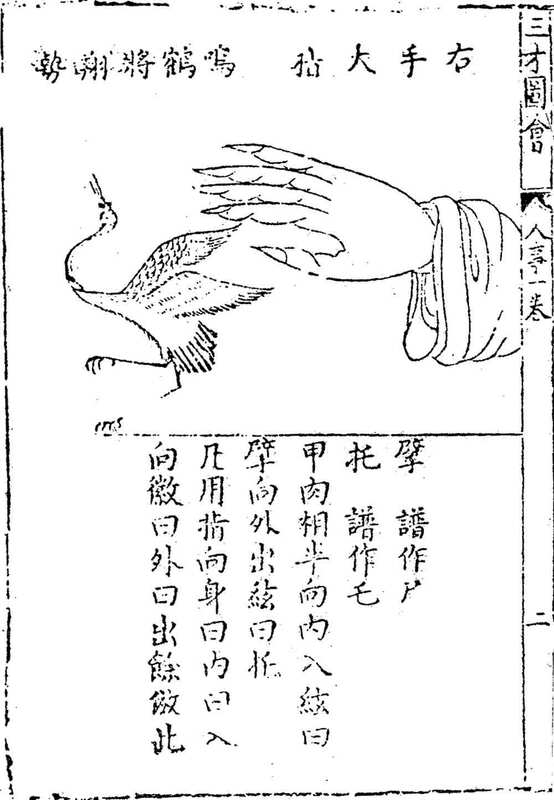 It is distinctive from most other such illustrations is that it has the hand and the representational image (鶴鳴 a crane calling out) within the same diagram. Compare, e.g., Taiyin Daquanji, Folio 3. 106 folios. 10.127. 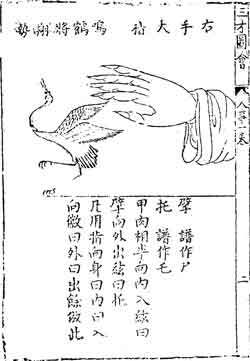 With its date given as 1607, it is not clear to me how the Xuji Continuation differs from it. 4. The quote is from ICTCL, p.528. He is also credited with a Chuncao Xianfang Qinpu.